Designer Necklaces: Add Some Attractive Necklaces To Your Collection From Craftsvilla! Jewellery plays a major factor in womens womens clothing, no matter where around the entire globe. No piece of jewellery is considered as inauspicious in the Indian culture. However one of the most important jewellery is the necklaces. Any jewellery set is incomplete without a perfect necklace. 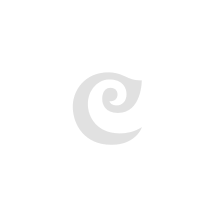 There are a lot of different kinds of necklaces available online at Craftsvilla. You can pick from the latest necklace designs and add them to your jewellery collection. 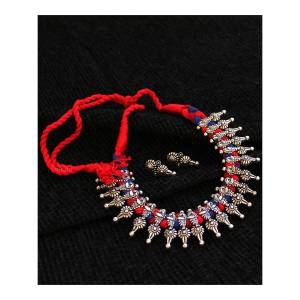 The necklace can instantly enhance the look of any of your outfits like Saree or a Lehenga. Added with the right earrings, it is the only thing you need to look your best at a party or an event. Ever since the ancient civilizations, necklaces have been the most preferred ornaments worn by women as well as men. To define a necklace, it is an ornamental piece that is worn in the neck and can be of different sizes types and made of different metals. 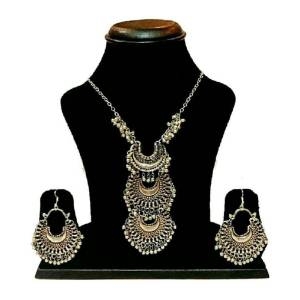 A necklace has been worn in the Indian civilization since the time of Indus Valley civilization. People in the ancient times made necklaces out of seashells, metals and even stones and leaves. With the advancement in the technology more and more people started discovering metals, and they started making necklaces of gold, silver, copper and much more. Gold has been considered as the most precious metal of all the time and is the most used in making the necklaces. With the change in trends, a variety of necklace designs came out. Not only women but even men were seen wearing necklaces in their daily wear. However, in the present time, most women are seen wearing big necklaces. The men are seen wearing gold chains around their neck only. Designer necklaces have become really famous amongst the people of the country and even the world. Different types of metals are used in designing these necklaces. Gold and silver are two most common metals. At Craftsvilla you will find all kinds of necklace designs be it the long necklace designs or the short necklace designs and much more. 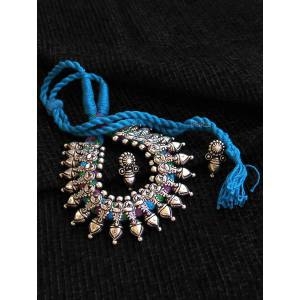 So, head to the Craftsvilla website for the best necklaces online. The first thing to consider is the shape of the necklace you are buying. The shape should complement your neck and chest area. Make sure that the shape is not too small for your neck and does not cause you any discomfort or injury while wearing it. The metal used in the artificial designer necklace determines its durability. So, make sure you always check the durability of the material of the necklace. Also decide whether you want the necklace in silver, gold, oxidized silver or much more. The design on the necklace or the stonework such as polki or kundan work should also be taken into consideration. Kundan necklaces are in fashion these days, and they can go with any clothing you wear. The durability of the set also needs to be checked. So, check what the warranty clauses given with the designer necklaces are. If there is a guarantee given with the necklace, there is a better chance that it is more durable and will last you longer. However, spending any amount on the things that do not have any guarantee is not the smartest thing to do. 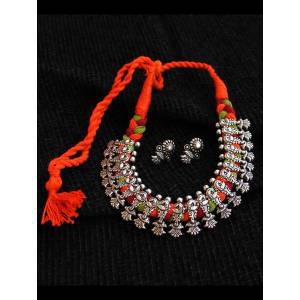 Craftsvilla has some of the best designer necklaces available for its customers. We have a huge variety including the stone necklace designs, thread necklace designs, traditional necklace designs and much more. There are also antique necklace designs and bridal necklace designs. All these varieties of necklaces are provided to the customer’s at the most cost-efficient price. We at Craftsvilla make sure that all our products are handcrafted to perfection by our designers. When it comes to making jewellery, comfort is one of the main things that we target for our customers. Apart from this, all the lightweight necklace designs have been brought to the customers from the different part of the world. We also have necklace designs in Grt that are some of the most famous amongst our current customers. Customer satisfaction is our motto, and we make sure all our customers are happy with the designer necklaces. Additionally, we also keep adding new designs to our collection now and then.